The internet is full of many wonderous things, not the least of which is a bevy of photo blogs. Of those photo blogs, however, one stands out: The Big Picture. This photo blog, run by Boston.com, is nothing short of amazing. Each entry they put out is around 40 crisp, clean pictures long, and now, the official Windows 8 app brings it full screen to your computer or tablet. As an app, The Big Picture is easy to use. Its main screen showcases the latest entries, such as yesterday’s 9/11 memorial and Monday’s harvest. Clicking on any one entry will bring you to the photo screen, where you can read about photos, flip through them, or even download them if you come across a truly amazing shot. 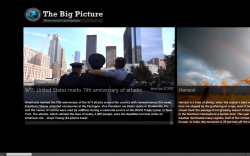 The Big Picture is not only a great photo blog, now it’s a great Windows 8 app. It has everything you could wish for in a photo blog reading app, including the ability to download photos, and its entirely black interface makes the photos really stand out. Overall, The Big Picture is definitely an app worth downloading if you enjoy spectacular photojournalism.